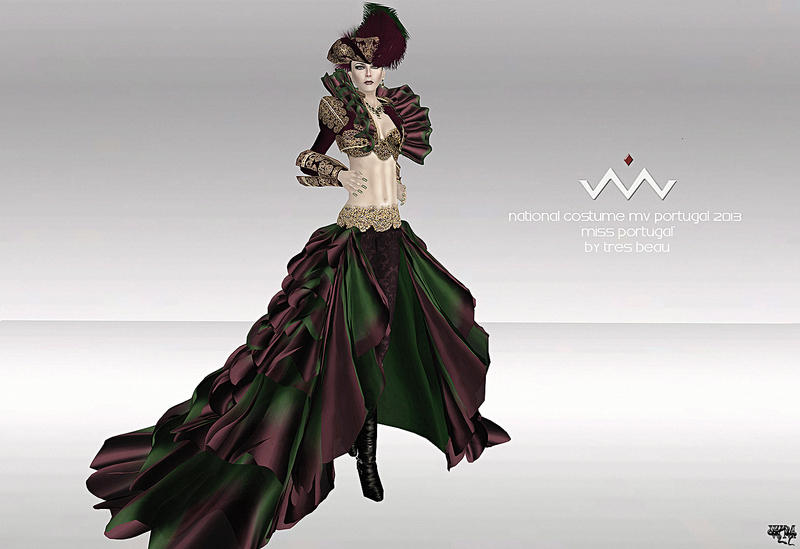 The national costume of Miss V Portugal 2013, Miss Jade Spectre, made me look up. Between all the gowns and costumes I saw one of a sudden pants and boots… That I had to see closer and I tried to zoom on Jade without crashing during the MVW 2013 finale. The pants made a light masculine, strong look. Paired with the super feminine ruffles and the detailed textures of Kimmera Madison, owner and designer of Tres Beau, just made a perfect outfit that for me and a great representation of portuguese tradition and history. For a better information about that, I would like to quote Jade herself with her little text for her national costume. “I wanted to pay tribute to the Cavaleiros – the remarkable women bullfighters who represent the rich history and long-standing traditions of the Portuguese culture. My respect for these women goes really deep and is unique to the Portuguese culture, so I decided I wanted to also bring that to the Miss Virtual World Pageant, but with a totally different approach to the style and design. Still specific to the theme, but with a more couture flair. These brave women perform on horseback in rich 18th century, colorful and extravagant designs. The Portuguese tradition of bull fighting is more compassionate and more of a show of tradition than other forms of bullfighting. Other than the Cavaleiros riding on horseback, they nor do the Matadors of Portugal kill the bull during the ceremony, nor do they harm it in any way. This entry was posted in Events & Contests, Fashion, New Releases and tagged 3D, 3D people, Art, avatar, beauty, beauty peagant, beauty pegant, Belle Roussel, Blog, Blogger, BOSL, Challenge, chop zuey, Clothing, contest, Couture, Dahriel, Dress, evening costume national gown, Evening Dress, Evening Gown, Fashion, Fashion in Pixels, fashion poses, Female Clothing, female wear, Formal, formal attire, Frolic Mills, Gown, Hair, High Fashion, Jade Spectre, Jewelry, Kimmera Madison, Last Call PosESioN, Malicia Python, Mandala, meta virtual, Metaverse TV, Miss Portugal, Miss Portugal 2013, miss v portugal 2013, miss virtual portugal, Miss Virtual World, miss virtual world 2013, Model, model pose, Model Poses, Modeling, Modeling pose, Modeling Poses, MVW, MVW 2013, National Costume, National Dress, New, New Release, New Releases, News, photographer, Pose, Posesion, Second Life, Secondlife, SL, SL Clothing, SL Fashion, SL Style, Style, Tres Beau, Virtual World, Wicca Merlin, woman. Bookmark the permalink.